PBS Kids offers some great materials connected to Click, Clack, Moo, including an activity worksheet with games, puzzles, word matches, writing templates for letters, scaffolding for story-telling, word finds, and other fun activities that can be done alone or with partners. This blogger created an easy-to-understand cause and effect packet related to the story line in Click, Clack Moo. She also provides consonant blend flash cards (perfect for Kindergarten to first grade). 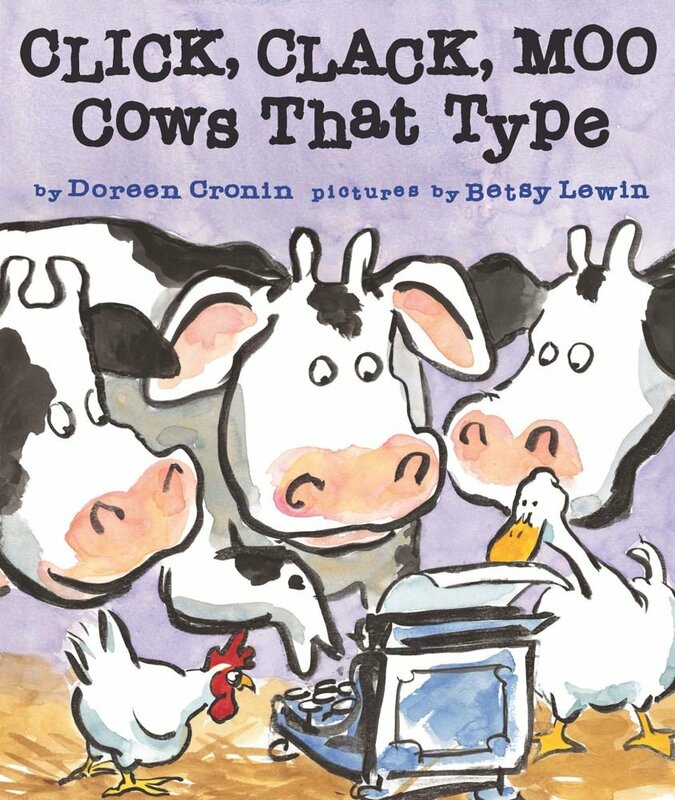 The story Click, Clack, Moo: Cows That Type is an award-winning children’s picture book published in 2000. This fiction book filled with humor helps children understand the negotiation process in simple ways. The story focuses on cows that live in a farm and attempt to make a deal with Farmer Brown for better working conditions. The cows type letters to Farmer Brown listing their demands for electric blankets because the barn is too cold. When the cows do not reach an agreement with Farmer Brown, they go on strike, and the hens on the farm follow suit by denying Farmer Brown the milk and eggs he needs from them. At the end of the story, the cows and Farmer Brown reach an agreement resulting in the cows and hens getting electric blankets which makes for a comfortable working arrangement, and Farmer Brown gets milk and eggs again. The ducks, however, get wind of the deal-making and get their hands on the type writer to try to negotiate with Farmer Brown for something they want… a diving board. I love this book because although it is about animals, the big idea and theme is so relatable to so many different groups of oppressed people. 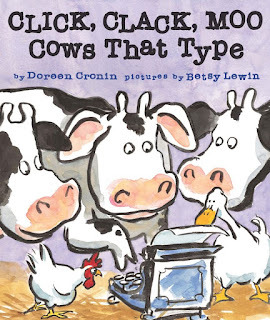 Click, Clack, Moo is a great example of Element Four because the book helps students learn that the way things are do not have to be a certain way, and that through persuasive letter writing and negotiations, students can learn that they are able to contribute to the change they want to see. Click, Clack, Moo has so many teachable moments where as educators, we can take a fictional story and relate it to the everyday life of students as well as historical movements by real people who insisted on change and made it happen. The story also has so much scalability, from teaching about negotiating in a classroom or school, to negotiating at the state or federal level. The farm animals worked together and used their words to communicate what they believed to be unfair working conditions. In the end, the ability to write persuasively and unionizing together to withhold their milk proved effective in the fight for fairness, and the book shows this in a way that is not overwhelming. Students will be instructed to imagine that they are an animal who lives in the farm. (e.g. pig, horse, sheep, etc.) They will have to write Farmer Brown a letter persuading him to give them something they want. The students will write their letter and draw a picture on the bottom of the page. The teacher will ask the children what they wrote and then type up their responses on the computer using a “typewriter” font. Each child’s letter will be displayed on the bulletin board in the classroom. Through this activity, students will learn the importance of negotiation and compromise, as depicted in the book. Students will be instructed to plan a birthday party for the classroom. Individually, students ponder over choices regarding activities, lunch food, and the type of dessert. Once the students identify his or her favorite and least favorite options, they come together and see what they agree on. They will need to come to an agreement about what to eat for lunch, what activity to engage in, and the type of dessert. Once students have identified favorite and least favorite, see if they can try to see what they agree on - can they negotiate an agreement peacefully? Help students understand the nature of a compromise: they may not be able to agree on all their favorite, but perhaps they can arrive at an acceptable plan by getting rid of options they students really dislike. Some students may not get their favorite lunch option, but maybe they do get to play their favorite activity.